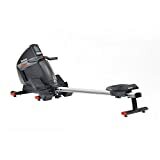 Get your upper and lower body moving with the Reebok One GR rowing machine. It offers you a great low-impact workout, and the 6.5kg (14.3lbs) flywheel will make your motion smooth and fluid. There are 16 levels of electronic resistance and 17 exercise programmes to choose from including time, distance, heart rate control, 12 pre-set, race and user defined. Keep track of your speed, time, distance, calories and strokes per minute using the quality LCD display. Add a chest strap (optional extra) and pair it with the built-in receiver to measure your heart rate. The comfortable, ergonomically shaped seat glides smoothly on the 1.23m (4ft) rail and the straps on the large footplate can be easily adjusted to suit a range of users. The rower features the easy locking and folding mechanism for easier storage when not in use.